Above, a home recently remodeled by Mount Baker Remodeling. Usually a custom homebuilder or remodeler is born to the craft. Parental guidance favors power tools and hardwood over baseballs and bats. Lawrence Tamkin‘s father wasn’t interested in either. "My dad, Frederick Tamkin, was an electrical engineer," said the owner of Mount Baker Remodeling affectionately. "And he would talk about electrical theory, circuitry design, and his latest television, radio or telephone inventions. I remember sitting in our kitchen talking to him on a cordless phone as he walked around the neighborhood testing it in the early days of cordless technology." Tamkin grew up in "a high-achieving, perfectionist Jewish family, and as such I did as expected in school, scored high marks, engaged in math competitions." He seriously considered following his relatives into the world of nuclear physics, but when it was time to choose his own career path, the younger Tamkin took one much less traveled. "It was the heretofore mysterious world of art and literature that caught hold of me," he said with a laugh. "So, by the mid-’90s in Seattle I had a fair amount of time on my hands as one of the many hippie poets floating around the city. Then I became friends with the guys who built Bauhaus Coffee Shops and Top Pot Donuts and they needed help. They were the ones who taught me carpentry." Blank verse’s loss was remodeling’s gain as Tamkin eased his way into construction work. He began by renovating a property owned by a girlfriend’s mother. Response was encouraging and he gradually took on more work. Years later, after he and Hilery Avritt were married, she opened Vitality Pilates, they worked together to adapt a retail space into a Pilates studio. They did it again when she moved to a larger space in 2002. She now has locations in Mt. Baker, Phinney Ridge and Ravenna. "Several of her clients complimented her on how beautiful that first location was and asked who did the design and remodeling," Tamkin recalled. "She bragged that her husband did the work." That prompted more offers than he could accept. He was busy helping Hilery run the studio and before too long there was a son, Adin. "I’m glad that I wasn’t greedy about taking on too much," he said. "I think there is a big benefit to progressing gradually. Even after I started my own business, I turned down a lot of home remodeling offers because I wanted to give each one the attention it needed and do the job right. Making mistakes along the way is necessary for growth: Falling off a cliff is not." His Mount Baker Remodeling now focuses exclusively on remodeling, room additions and home repairs. It does no new construction. "Remodeling and new construction are vastly different worlds," he explained. "Every project is completely new with a unique set of problems. We like to look at each one as a fresh puzzle to solve. We never apply cookie-cutter solutions and that allows us to create something that’s both cost-effective and beautiful." It’s a quality that gives Tamkin a big advantage in a field that now has various niches of interest to homeowners. These include green technology and integrating various levels of energy efficiency into a design. "We always try to introduce subtle and not so subtle green aspects into our remodeling," he said. "It used to be very expensive, but now that it isn’t, we tell each client they can remodel with no green technology or go 10, 25, 80 percent green … whatever they want." A few years ago the Tamkins purchased their current home, a traditional colonial/early 1900s house, with the help of Marilyn Smith Real Estate. 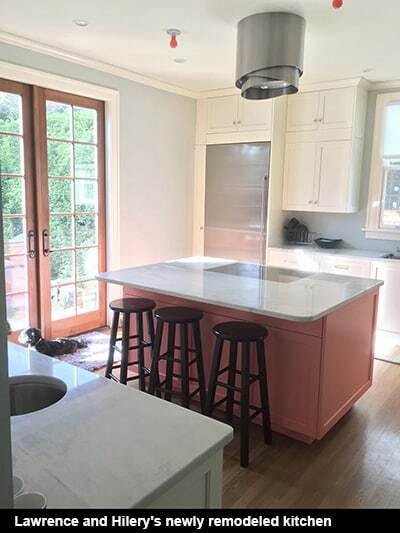 Naturally they remodeled it, opening up the floor plan to enlarge the kitchen to accommodate a new island and opening up the dining room, too. The upstairs master suite gained a balcony, and the basement was finished to create a cozy living space. "I am actually quite proud of our house," Tamkin said. "It is large and there were a lot of different ways we could have gone. My wife and I were the clients, and we had our own ideas at first. But we agreed on maintaining the original ‘intention of the house,’ specifically its light airiness as well as the original molding. We didn’t want to overfill it or chop it up, yet do certain modern modifications, like the larger kitchen and creating a master suite that’s integrated with a master bathroom. "While I’m proud of how our house turned out, I am even more gratified that my marriage is stronger than when we started the project," he continued. "Most people bring a certain amount of angst to the remodeling world because they’ve heard the horror stories and may already have experienced disagreements with a spouse about which direction to take and how much to spend. "I have learned a lot about helping clients. The priority should be pursuing a shared vision of beauty rather than arbitrary perfectionism. "We like to come in, get to know the people and see where they are and what they’re comfortable with. That way we’re able to really help them do what they want to do, but do it so that it’s a relatively pleasant experience." These days, when Lawrence and Hilery walk around their neighborhood, checking in with 14-year-old Adin by smartphone, they’re likely to pass a home Tamkin remodeled. As it says on the Mount Baker Remodeling website, "It takes a special construction company to work for their neighbors." To contact Lawrence and Mount Baker Remodeling, call 206-240-3240, email, or visit the website. Design and Remodel work by Mount Baker Remodeling.